Okay I have to tell you I have no great story this time. But in few cases such as this, isn’t the subject striking enough in its own right without the need for a story to make the portrait interesting? Well it so happened that the morning was misty and it is a great feeling to wake up in a sleepy little village perched on some mountain slope in the Himalayas. But the thing is, the small pretty village with apple orchards was a far cry from being anything but sleepy. Bharmour was once a sleepy village as the old men told me. Being the starting point for the Manimahesh Yatra so stringently undertaken by thousands of devotees every year, the village has been the victim of the tourist influx and blatant commercialization that we know of. A small room can cost you anywhere between 500 – 1000 bucks. And at times the same small room will be shelter to more than 20 people at once. Well anyway someone is making a lot of money here and I should talk about how I met this person instead. Srini and me went up to the famous 84 Lingas temple. It sure looked crowded enough leading us to believe this temple does hold high reverence in the local community here. The architecture was distinctly different from what we see down south and quite a few Sadhus were found around. While I scouted for some interesting capture, I spotted this man with this huge red turban. I was hesitating. Should I go ask him or not. Good thing I asked him right? Location – Bharmour, 7000ft, Budhil Valley, Chamba. 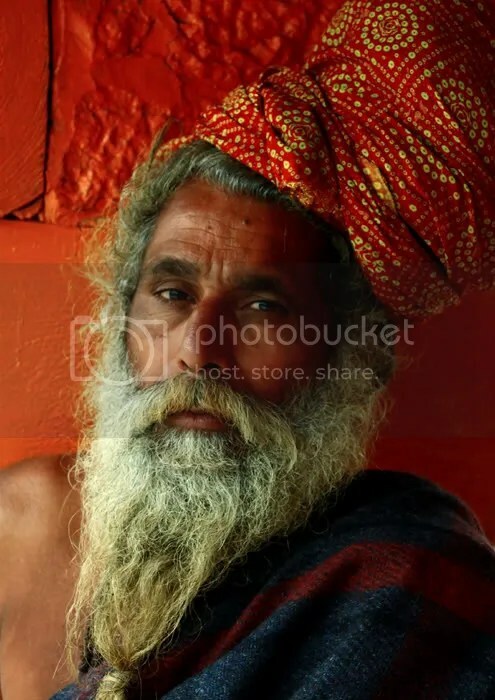 This entry was posted on December 9, 2010 by Neelima V. It was filed under photography, portraits, Stranger and was tagged with 50mm, red, turban. Good one! the turban tied at that rakish angle and still remaining there is great! guess it would be tied to a knot in his hair? I dont remember seeing posts about the temple, though… have to search for it now!